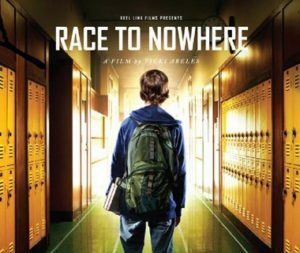 This past Sunday I was invited to a screening of the documentary, Race to Nowhere, and sit on a discussion panel afterwards. This particular event was hosted by a private K-8 school in Austin, and it was a chance for parents to 1) see the film, and 2) discuss the issues raised. I was very impressed with the level of engagement by the parents in attendance and the questions they had. This particular documentary was released in 2010. It focuses on the rise in anxiety and depression as a result of increased academic demands on students. The issues included increased homework load, pressure to take too many AP courses, the demands of extracurricular participation, the rise in standardized testing as a result of No Child Left Behind, and many other external factors affecting our kids’ well being. The film essentially chronicled several students’ lives as they navigated stress-inducing circumstances. Many of the students expected to go to college, and most all of them felt the pressure to get into a “top” school was off the charts. Almost everyone in the documentary agreed that our current educational system is failing our students both academically and emotionally. One of the main points in the documentary was the rise in homework for our kids. It was not uncommon for many of the students’ to experience up to six hours of homework per night, which required bedtimes after midnight. Interestingly, one AP Biology teacher implemented a “no homework” policy in his class, and the AP scores that year actually increased. All told, reducing the amount of homework for kids had several positive impacts. This was a main talking point in the discussion after the movie. Personally I think there is some validity to a “no homework” policy, particularly when the homework is simply busy work. We ask kids to be on from 8:00 a.m. to 3:30 p.m. every day. How much more brain power is left at the end of the day? Is it reasonable to ask kids to use their brains for an additional two to six hours? And how many colleges require homework? Almost none. So if we are preparing our kids for college, then how does assigning tons of homework help? I’d argue it doesn’t. Project-based learning is proven to be much more effective since it increases critical thinking skills. The documentary explored both public and private schools. As mentioned above, No Child Left Behind, which required schools to administer standardized testing in order to gauge teaching effectiveness, is a major problem. Many public school teachers now feel they must teach to the test and cram information in simply so their students pass. And to make matters worse, teachers bonuses are tied to the number of kids who pass. The overall message was teachers don’t feel compelled to teach critical thinking skills; rather, they feel compelled to teach kids exactly what they need to know for the test. Several employers were interviewed in the documentary and agreed that younger employees are less capable of problem solving. Unfortunately those involved in private schools did not seem to fair much better. While the curriculum in private schools is a bit more flexible and doesn’t require the amount of standardized testing as public schools, many of the private school students felt a ton of pressure to get into a top school. As a high school counselor at a private school, I can empathize. Just about all of our students go on to 4-year universities, even if some would benefit from a gap year or community college. It’s not always in the best interest of the student to attend a prestigious college, but that remains the goal for everyone at private schools. After the screening of the movie, parents had several questions for the panel. The biggest question I received was: As a counselor, how do you know when students are struggling? My answer was: Be involved in your child’s life. Know whom they are hanging out with. Know what classes they are taking. Don’t ever assume your child is doing ok. Always ask questions, even if they are hard and uncomfortable. This is my best advice for most parents. It’s easy to assume a child is doing well, but it’s impossible to know unless we have the hard conversations. Almost every kid will open up once you get them talking. It’s amazing how many students I see that, on the surface, are doing fine, but underneath are struggling. It’s our job as the adults to have the hard conversations. If you’re not comfortable having them with your child, then you should seek help in how to do so. The documentary, Race to Nowhere, definitely brings up some valid points. I do believe kids are facing unprecedented pressure to succeed in way too many areas in life. I also feel that homework loads are probably unnecessary, especially when it’s just busy work. After viewing the movie, it makes me consider how I work with students and advise them and their families. However, to play Devil’s advocate, I also think the documentary was fairly one-sided (as most documentaries are). Yes, there are students experiencing anxiety due to pressure in school. But for every one of those kids, I see several students who do have balance. I also see quite a few students who aren’t doing enough. So take this film with a grain of salt. It brings up some good points, but at the ends of the day, parents and students can dictate most of the direction they take in school. Since this film is ten years old, it would be interesting to see how things have evolved since then. There is a follow up film, Beyond Measure, that the same school will screen in February. I’ll be sure to write my thoughts about that once I see it. In the meantime, try to enjoy school and find that balance in your life!